Houndmills, Basingstoke Hampshire ; New York : Palgrave, 2011. Science fiction, English -- Study and teaching. xxvii, 266 pages ; 22 cm. Design, delivery and evaluation / Andy Sawyer and Peter Wright. edited by Andy Sawyer and Peter Wright. 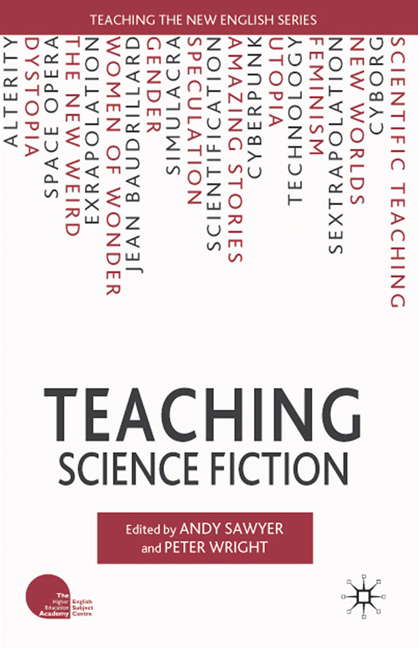 Add tags for "Teaching science fiction". Be the first. Science fiction, American -- Study and teaching. schema:isPartOf <http://experiment.worldcat.org/entity/work/data/3901693005#Series/teaching_the_new_english> ; # Teaching the new English. <http://experiment.worldcat.org/entity/work/data/3901693005#Series/teaching_the_new_english> # Teaching the new English.